Congratulations to GGGA’s Early Signees! Early signing day was on Wednesday, November 14, 2018, and cause for celebration at GGGA. Congratulations to GGGA student-athletes who made early commitments to these prestigious Division I schools. The National Letter of Intent (NLI) is an agreement between a prospective student-athlete and an NLI member institution. The prospective student-athlete agrees to attend the institution full-time for one academic year, and the institution agrees to provide athletic financial aid for at least one academic year. The selection, application, and acceptance process to play on a college golf team is challenging. At GGGA, the College Assistance Program (CAP) helps GGGA students navigate the college golf recruiting process and find the best fit for them both athletically and academically. 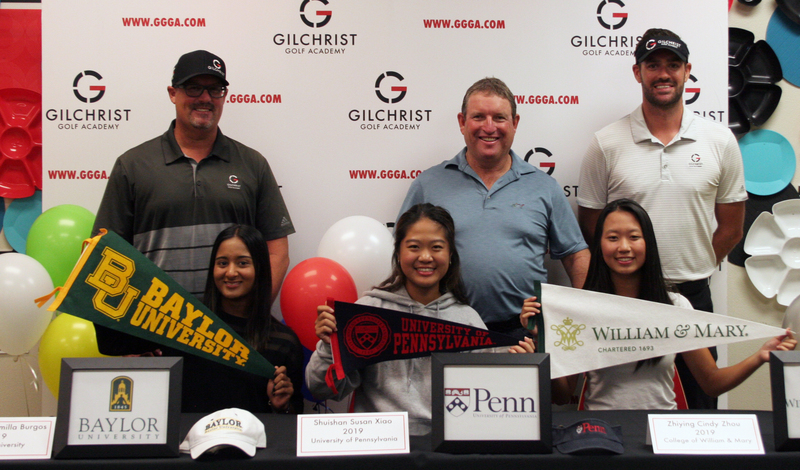 Gary Gilchrist Golf Academy has a history of producing high-level student-athletes and we are very proud to see the tradition continue with these three talented, hard-working student-athletes. To learn more about GGGA and our College Assistance Program, call 1-866-639-9099.